800,000 children are reported missing each year. 200,000 children were the victims of family abductions. 58,000 children were the victims of non-family abductions. 115 children were the victims of “stereotypical" kidnapping involving a person unknown to the child or slight acquaintance, who holds the child overnight, transports the child 50 miles or more, demands ransom, or intends to keep the child permanently. 800,000 Missing Kids? Really? Overstaying a visit with a noncustodial parent qualifies as a family abduction. Some missing children have multiple entries in the database due to multiple disappearances on different occasions resulting in misleading statistics. Out of Sight -- A child's chances of being abducted by a stranger are rare, and kidnapping ending in murder is rarer. There is one child abduction murder for every 10,000 reports of missing children, according to the Attorney General of Washington state. Parents feel children should be warned about "stranger danger," but also fear scaring them and the greatest threat to a child is a family member or friend. The media's fixation with pretty white girls who become victims is so prevalent that the concept has been coined the "The Missing White Girl Syndrome." Girls of a certain image receive disproportionate media play while missing and exploited minority children never make it beyond the local media and are soon forgotten. The Missing Pretty Girl Syndrome. Why do so many people seem to care so much more about beautiful missing white girls from privileged backgrounds than economically deprived children of all races and backgrounds.If you’re missing, it helps to be young, white and female, the legendary Damsel in Distress . National Estimates of Children Missing Involuntarily or for Benign Reasons Bulletin: OJJDP NISMART Series, July 2005. The International Centre for Missing & Exploited Children (ICMEC), launched by the U.S.-based National Center for Missing & Exploited Children in 1998 to identify and coordinate a global network of organizations fighting child-sexual exploitation and abduction. State -- The National Center for Missing & Exploited Children (NCMEC) clearinghouse program provides communication between clearinghouses, training, and technical assistance to assist with missing-child cases. Each state, District of Columbia, Puerto Rico, and Canada have state clearinghouses of missing children. The focus for state clearinghouses are data collection, networking, information distribution, training and technical assistance for missing- or sexually exploited children. State clearinghouses are located in law-enforcement agencies with the exception of Louisiana where it is managed as part of the Department of Social Services. The Association of Missing and Exploited Children’s Organizations (AMECO)is dedicated to serving nonprofit missing and exploited children agencies throughout North America. They recruit members who abide by strict ethical practices adopted by the organization and who are competent in the field of missing children at the community level. Member organizations offer services to parents of missing, runaway and abducted children. AMBER Alert: Best Practices Guide for Public Information Officers, OJJDP July 2006, NCJ 212703. (16 pages). An agency believes the child is at high risk of serious bodily harm. Since the late 1970s there have been reports of children of former members of the Children of God, The Family, and The Family International being abducted and moved to other countries to keep them from parents, law enforcement and child welfare from finding them. Trenton Duckett was two years old when he was reported as missing by his mother, Melissa Duckett, on 8/27/06 from his bed in the apartment he lived at with his mother on the 1400 Block of Griffin Road in Windmere Villas, Leesberg Florida. 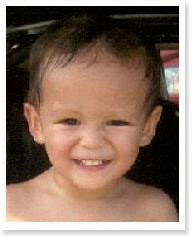 Trenton has his mother's Asian features and coloring with brown hair and eyes. He was about 30" and 30 lbs. Even though the case was never solved, the suspicion focused on the mother. Not long after a grueling telephone interview by Nancy Grace show where Grace behaved like an unleashed pit bull trying rip a confession out of this very young mother by accusing her of being the person her responsible. Meanwhile Grace has the husband there and is touting this less than devoted father and husband like a hero. Shortly after that Melissa killed herself at her grandparents home. Trenton has never been found. Rilya Wilson should have been monitored monthly by child welfare. Her grandmother who cared for Rilya and her 2 siblings, believed she was in the custody of Florida's Department of Children and Families. "They continually told my sister and me to leave it as it is, that Rilya would be coming home to us … but they had no idea where she was." Geralyn Graham, 58, was charged with kidnapping Rilya and three counts of aggravated child abuse causing great bodily harm. Graham, is serving a three-year sentence for fraud. Roommate, Pamela Graham, was charged with child abuse. Evidence of Foul Play -- Eleven-year-old Shakira Johnson did not meet Ohio's criteria for an Amber Alert, placing her in the category of runaway or parental abduction. Sabrina Aisenberg - Nov. 24, 1997, a call to 911, placed by Marlene Aisenberg reported her 5 month old infant, Sabrina, was missing. The mother claimed she and her husband, Steve put the infant in her crib at 11 o'clock the prior evening and awoke the next morning to find an empty crib. In 1966, the Beaumont Children Jane Nartare, 9, Arnna Kathleen, 7, and Grant Ellis, 4, disappeared from a beach near Adelaide Australia. Their case resulted in the largest Australian criminal investigation in history, and remains unsolved.